As we sat peacefully in our Sneer Studio on this sunny late October afternoon, a terrible thing happened. The ground began to shake and a writhing, wriggling column shot up through the floor, causing many thousands of dollars in damage, both to the HQ and to our delicate psyches. The peak of the living mass formed a mouth and bleached hair, and after carefully placing some coolguy sunglasses, raspily whispered, “immortalize me” with a voice of a thousand cicadas rattling at once. Science is more horrifying than any horror fiction, boys and girls, and it is a known fact that for each and every human being on this planet, there are 40 tons of insects. 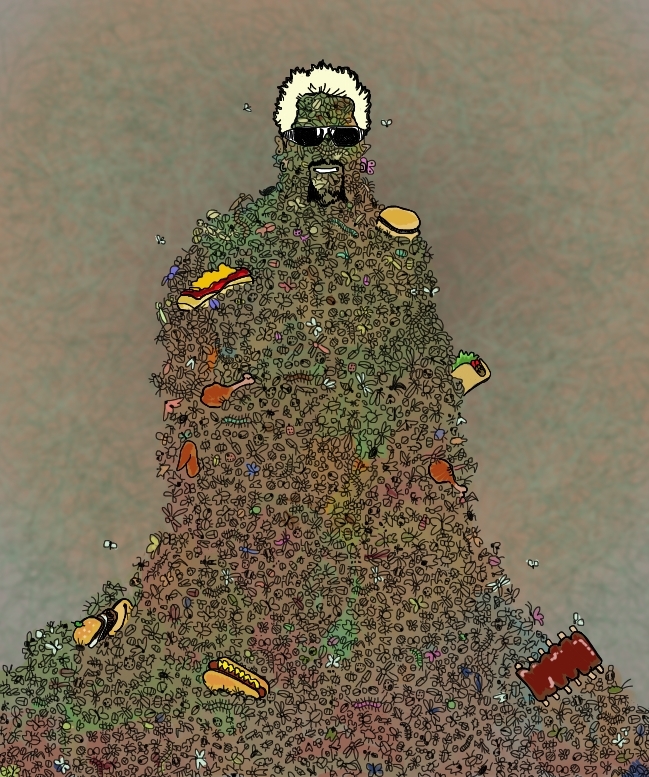 Except for the celebrity, Guy Fieri, who IS 40 tons of insects along with some incredibly unhealthy foods (which are themselves comprised mostly of insect parts).